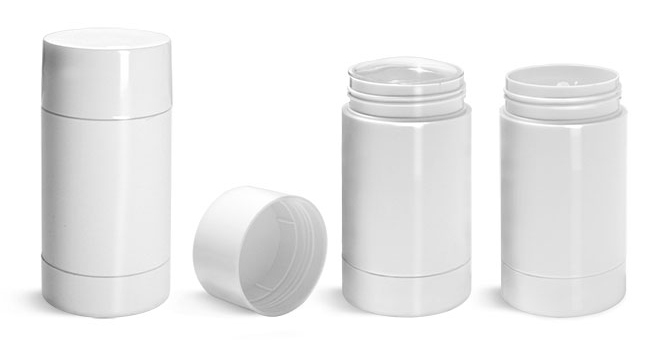 To fill these deodorant containers, first place upside down, with cap and disc insert in place and the base off. Fill with product from the bottom, up to the plunger (the internal mechanism with three oblong holes that will move the product upward). Be sure not to fill above the plunger or the tube will not function properly. Next, insert the base back on the bottom of the tube. After the product has solidified fully, unscrew the cap, remove the disc and the product is ready for use. These 75 gram deodorant tubes are made of white polystyrene. Polystyrene is a hard, and lightweight material with excellent clarity. These tubes come with matching white screw caps and clear disc inserts. To dispense contents of these deodorant tubes simply twist the container's base counterclockwise. These white tubes could be used to package deodorants, sunscreens, solid perfumes. Filling must be done from the bottom of the deodorant containers, see Info section for further instruction.